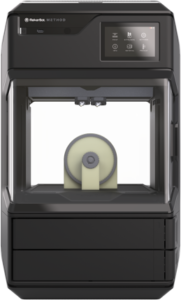 MakerBot Materials for Method are extensively-tested for the highest reliability and measurably accurate parts. Safe for the classroom, office, or home, this material is non-toxic and easy to print with minimal warping or curling. It’s also the best, most consistent material to use with previous MakerBot Replicator 3D printer models. highest quality with MakerBot 3D Printers. MakerBot 3D Printing Materials are optimized to give you the best results and highest quality with MakerBot 3D Printers. Get prototypes and production parts out the door quickly and efficiently with MakerBot 3D printers. MakerBot offers the easiest setup experience with no tinkering required. Get started right away with hundreds of 3D printing lesson plans. MakerBot’s award-winning desktop 3D printer is engineered for fast and reliable 3D printing.